Dinn-R-Bell Single Blade Buzzbait - If you're looking for a buzzbait that calls up the big fish - look no further. 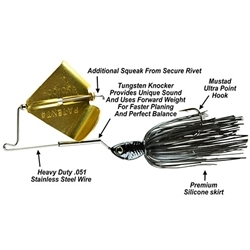 The Picasso Din R Bell Buzzbait uses a TUNGSTEN KNOCKER to provide a unique sound the likes of which bass have never heard. Manufactured to achieve the perfect balance, increased casting distance, straight tracking and quick planning, its compact design allows it to be fished over structure such as blowdowns and grass without getting hung up. The 1/2oz size of the Picasso Din R Bell Buzzbait is ideal for throwing during windy conditions where traditional lighter size buzz baits have to be put away. Because of their greater casting distances, they are also ideal for fishing long points and clear water where the fish are spooked easily. The Picasso Din R Bell Buzzbait is constructed using .051 heavy gauge wire that is nearly indestructable and comes equipped with a super sharp Mustad UltraPoint hook for faster hook penetration with an ideal barb size to keep fish on the hook. Big bass don't miss too many meals - ring the bell and watch them come calling.